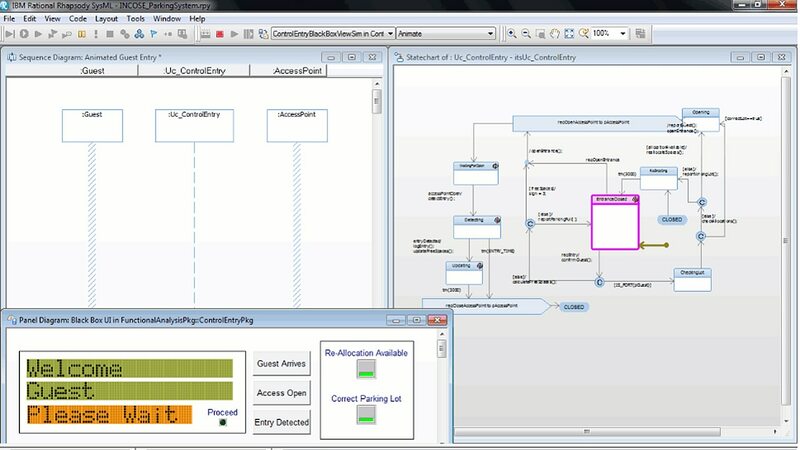 Rhapsody - Architect for System Engineers lets you use SysML and UML to analyze requirements, perform trade studies with parametric constraint evaluator and design structural and behavioral aspects. You can visualize complex requirements and maintain design consistency. It includes parametric constraint solver for SysML parametric diagrams, which facilitates trade study analysis and architectural trade-offs; and provides static model checking analysis to improve model consistency. You can link requirements to design elements and test cases to help ensure coverage and assess impact of change. The solution supports full requirements traceability to and from the design. When a requirement is changed, you can view how the change impacts the design. IBM Engineering Lifecycle Management software helps teams collaborate to manage the complexity of developing consistent designs across different environments. You can share and review designs with your extended team using IBM Engineering Systems Design Rhapsody - Design Manager. The advanced model browser allows teams of engineers to quickly sort, organize and edit their models. Graphical model comparisons and merging of model elements enable teams to work in parallel. You can graphically capture designs using industry-standard SysML and UML or Domain Specific Languages (DSL) such as AUTOSAR, MARTE or DDS. Create your own unique diagrams and diagram elements using UML profiles to tailor the development environment to fit your needs. IBM Engineering Systems Design Rhapsody - Design Manager integrates with other IBM ELM products, such as IBM Engineering Requirements Management DOORS Family and Workflow Management. Rhapsody for DoDAF, MODAF and UPDM add-on software enables you to create US Department of Defense Architecture Framework, British Ministry of Defense Architectural Framework and Unified Profile for DoDAF/MODAF artifacts. Rhapsody - Tools and Utilities Add On software offers a customizable documentation utility.